Have you been looking for a healthy alternative to soda for your children? 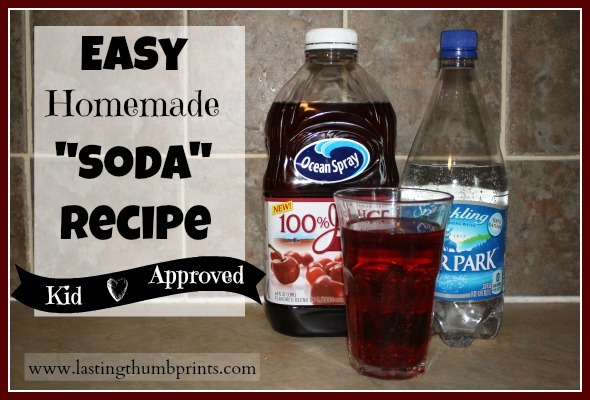 Then you’ve got to try making this easy homemade “soda”! We’re not regular soda drinkers in our home, but we do have it occasionally. We try to avoid consuming it, but some of us do better than others. 😉 I’m pretty certain I could become a root beer addict if I allowed it, yum! Every once in a while I crave something fizzy. And I like to have a fun drink for celebrations to make them more special for the kids. I’ve been making this simple homemade “soda” recipe for over 10 years now and our kids still enjoy having it. Try this simple two ingredient recipe to make a healthy, homemade alternative to soda. Combine equal parts fruit juice to seltzer water. It doesn’t keep its carbonation for very long. Make it in a serving size that you will consume in one day. Not all juice is created equal. I change the ratio depending on the sweetness of the juice. We only use 100% juice. Seltzer water has more carbonation than sparkling water. It’s best if the drinks are cold when you combine them. I love having a healthier alternative to soda that my whole family likes!